RAINE & Horne International Zaki + Partners Sdn Bhd senior partner Michael Geh is confident the time is ripe to market Penang properties more aggressively to the Japanese market. 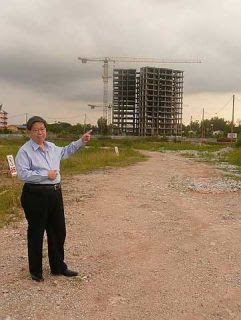 His latest project is to sell three tower blocks at the Teluk Air Tawar condominium development in Butterworth to Japanese who are keen to have a vacation or second home close to three golf courses. Located north of the Butterworth ferry terminal, the project site takes only 15 minutes to reach by car via the newly-built Seberang Perai Coastal Road. Comprising 72 three-bedroom units in each of the three blocks, the project was revived this year and is undertaken by Welcome Properties Sdn Bhd. Standard units have a built-up space of 1,328sq ft and come in two layout designs. They are all designed as corner units. The en bloc sale is estimated at RM30 million per block. Geh, whose firm is in Penang, cites the scenic coastal location with a panoramic view of Penang island as an important selling point. The development site faces Tanjung Bungah and Tanjung Tokong on the island. Location map of Teluk Air Twar condo project, dotted line in the map indicates the Seberang Perai coastal highway. But the main attraction for targeted Japanese buyers is the proximity of the Teluk Air Tawar condo development to three golf and country clubs, namely, Cinta Sayang, Permaipura and Havard Jerai. They are all located to the north-east in Kedah. Cinta Sayang is only 20 minutes away by car. And with the vibrant growth of commercial centres and retail outlets in Butterworth, residents will have no lack of shopping facilities such as the Tesco, Makro and Carrrefour hypermarkets. As for food and beverage outlets, the highly popular Auto City commercial centre at Juru is a choc-a-block full of bars and restaurants offering all types of cuisines including Japanese and Korean as well as Western food. With liberal conditions under the Malaysia My Second Home scheme, the Teluk Air Tawar development may soon become another Japanese enclave with spin-off services to cater to this expatriate community. MALAYSIAN property developers seem poised to undertake megaprojects with world-class facilities but the country lacks marketing specialists able to sell effectively to international investors. But property consultant Michael Geh, senior partner at Raine & Horne International Zaki + Partners Sdn Bhd, has a vision to help improve the marketing skills of not only his fellow real estate practitioners and agents but developers and their marketing staff. Newly elected as the FIABCI vice president for network and marketing for 2008 to 2010, Geh will make a case at the federation's meeting this month in Amsterdam for internationally-recognised professional real estate courses to be introduced in Malaysia. Based in Paris, FIABCI is the French acronym for The International Real Estate Federation. Some 100 national real estate associations representing 1.5 million professionals are affiliated to the federation. “During my two-year term, I'm committed to do something to enhance the level of real estate marketing skills in Malaysia,” said Geh. “As FIABCI's elected representative in the Asia-Pacific region for network and marketing, there are certainly a few things which I can contribute. “In the Malaysian property sector, there are currently two crucial things lacking, international marketing skills and transnational marketing skills for both agents and developers. At best, such skills are at a very low level. Geh plans to get the approval of FIABCI headquarters in Paris to allow courses from their FIABCI University (www.fiabciuniversity. org) to be conducted here. Said Geh: “I look forward to getting FIABCI University, which is like London's Open University, to conduct courses in Malaysia. This is to enable FIABCI members in this region to benefit from such a development. “Another possibility is to have the Certified International Property Specialists (CIPS) course by the United States National Association of Realtors to be introduced here,” he said, adding that he qualified as a CIPS member in Bangkok two years ago. There are only three people in Malaysia who have CIPS qualification. Geh envisaged that with readily available opportunities to improve themselves, real estate agents will be motivated to act more professionally especially if they are duly rewarded. He cited the Malaysia My Second Home scheme as a prime example of how better international marketing skills can promote the programme more effectively. Professional agents will encourage foreigners who target South-east Asia as a possible base to relocate or buy a vacation home here. Said Geh: “We also need world class real estate practitioners to handle world class projects. “Developers in general have a limited understanding of international sales and their attitude towards their sales agents is equally limited. They don't really take it seriously. “When it comes to international sales, developers deem it adequate to allocate 1% to 2% sales commission. “In Singapore, Hong Kong and Europe, developers use estate agents as part of their marketing plans during the pre-launch and even the developmental stage. Obviously, the developers also have their own inhouse marketing team as the backbone to take care of details. “Major international sales are conducted by highly-skilled estate agents with important networking connections. There are such factors as international co-brokering and referrals. In this situation, Geh pointed out that property websites flourish and developers are putting their money in such websites. But as skill levels increase, transactions will go back to a person-to-person basis and there will be a higher degree of networking success. In mature markets, for example, in the U.S. and Europe, everything is done on a cobrokering basis. In the Philippines, the fee is 5% of the transacted price. But Geh stressed that skills can't be gained “overnight”. “We need to have professional training and expertise to be taught here. But some say that by promoting such courses, I'm just creating more competitors for myself. But I don't see it that way. By having such courses here, we can all benefit. KUALA LUMPUR: IGB Corp Bhd is expanding its Mid Valley City development, which would see the group launching two 42-storey blocks of condominiums. Group managing director Robert Tan said the two blocks would have a gross development value of RM750mil. The units are due for launch by the third quarter. The condominiums, which would cost about RM650 per sq ft, would be the last component in Mid Valley City, he told reporters after the company AGM yesterday. Tan also said IGB was looking to build a hotel each in Bangkok and Australia as it sought to expand its hotel business overseas. The proposed RM200mil hotel in Bangkok would be undertaken by a joint venture between IGB and a foreign party. Under the joint venture, IGB’s 49% stake would cost RM100mil. The hotel would be managed by IGB’s hotel management arm, Cititel Hotel Management Sdn Bhd. Construction cost was estimated at A$80mil to A$150mil, Tan said. On its Micasa hotel property in Kuala Lumpur, Tan said IGB was keen to dispose of a 50% stake and was in talks with an interested party. IGB Corp Bhd hopes to begin construction of its St Giles hotels in Bangkok, Thailand and Sydney, Australia next year, which it will then manage. "In Bangkok, we are trying to finalise the deal. We are looking for a strategic partner. We have identified and are in negotiations with a few parties," managing director Robert Tan Chung Meng said. Tan said the hotel ownership will be on a 51-49 per cent basis, in which the Thai partner will hold the majority stake. "It will be a 650-room four-star hotel. Our portion of the cost of construction will be RM100 million. We hope to finalise something within the next six months," he told reporters after the company's annual general meeting yesterday. In Australia, IGB is negotiating to build either a A$80 million (RM248 million) 250-room hotel or a A$150 million (RM466 million) 450-room hotel. These two new hotels will add to its Cititel and Cititel Express brands, MiCasa All Suite Hotel in Yangon, Myanmar; and New World Hotel in Ho Chi Minh City, Vietnam. IGB also owns and operates the Boulevard Mid Valley and The Gardens Hotel in Mid Valley. Asked about the status of plans to sell the 242-suite MiCasa All Suite Hotel in Kuala Lumpur, Tan said that it has held talks for the sale of a 50 per cent stake in the hotel. Although he declined to reveal how much the 50 per cent stake may be worth, it is believed that the entire property could go for as much as RM230 million. 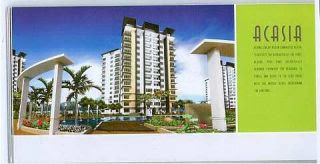 Meanwhile, IGB said that it will launch the final phase of the Mid Valley City project by the third quarter of 2008. "The final phase consists of two 42-storey residential blocks with different configurations. The gross development value for the project is estimated to be RM750 million," he said. IGB plans to sell the property from RM650 per sq ft onwards. In the current year ending December 31 2008, IGB expects its asset management and hotel business to be the main profit contributor.